Apple released the iOS 6.0.1 firmware today, and although we told you not to update, if you did and you have an A4 iOS device, you will be glad to know you can indeed Jailbreak tethered. Even though RedSn0w was updated today, the update did not add support for the iOS 6.0.1 firmware explicitly. As such, you will simply need to perform the extra step of pointing RedSn0w to the applicable iOS 6 firmware and the Jailbreak will work without any hiccups. Note: For a Windows version of this tutorial please click here. Step 1) – The first thing you will need to do is download RedSn0w 0.9.15b3 for the Mac OS X operating system using the download mirror below or through the iJailbreak Downloads Section. You will also need to download the iOS 6 firmware for the device you are Jailbreaking, which can be found in the downloads section. Step 2) – Once you have downloaded RedSn0w 0.9.15b3 and your iOS 6 firmware file you will need to launch it by double clicking on the Redsn0w app. Keep in mind that to launch RedSn0w on OS X 10.8 Mountain Lion you will need to hold down the control button, click the RedSn0w and then click the Open option. 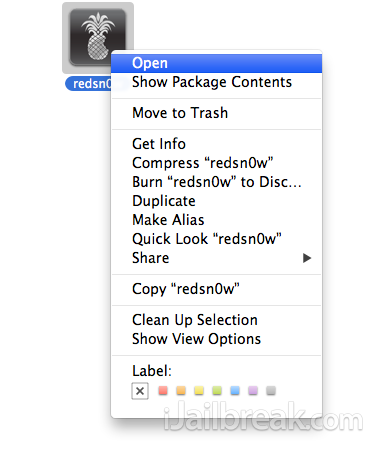 Step 3) – With RedSn0w up and running you will need to simply click the Extras button. Step 4) – Next click the Select IPSW button and select the applicable iOS 6 firmware file for your device. After RedSn0w successfully recognizes the firmware you will need to click the Back button, followed by the Jailbreak button. Step 5) – Once you click the Jailbreak button you will be presented a screen with preparation instructions for entering DFU mode. Read through these instructions, power off your iPhone or iPod Touch if you haven’t already, and then click the Next button. 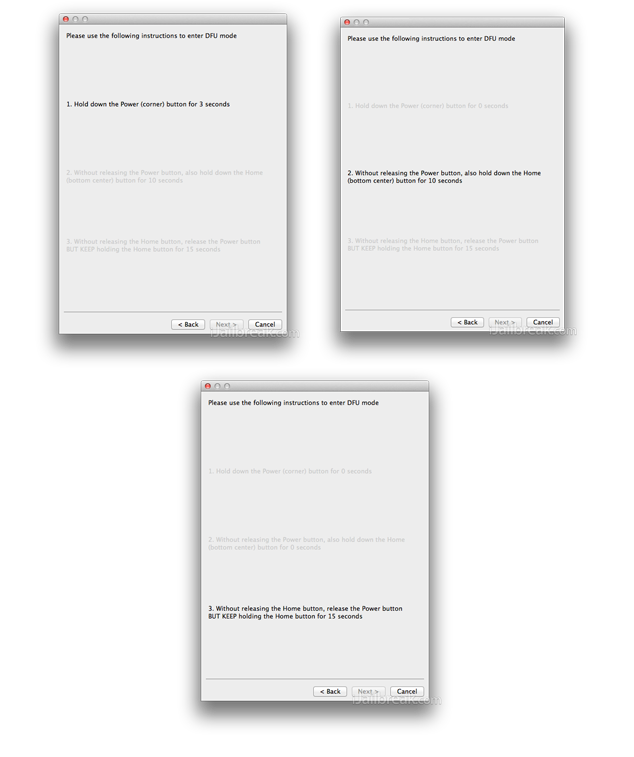 Step 6) – After you have entered DFU mode, RedSn0w will begin processing the iOS 6 firmware. When the firmware has been processed you will come to a screen with a few options for your Jailbreak. 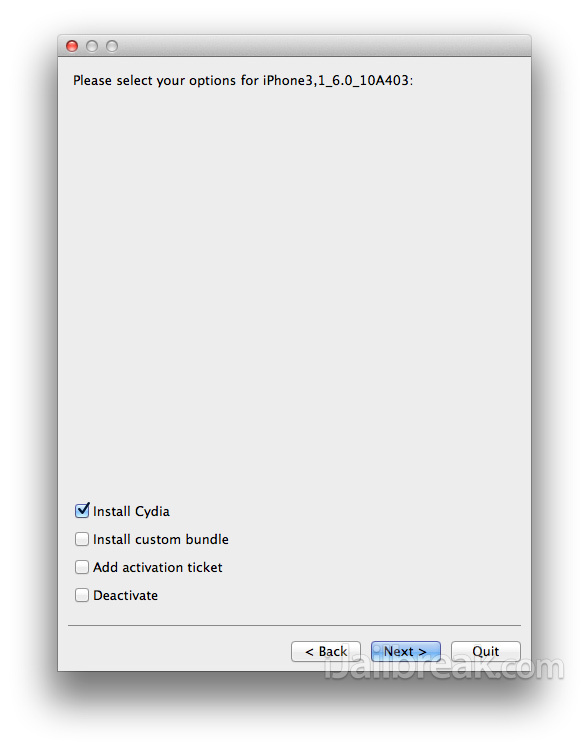 Ensure that the “Install Cydia” option is checked, and then click the Next button to begin the actual Jailbreaking process. Step 7) – RedSn0w will now begin jailbreaking your iPhone or iPod Touch. DO NOT interrupt or use the computer during this time. When the iOS device is finished being jailbroken it will reboot into a non-Jailbroken state (or in some cases will not make it past the Apple logo). This is because you have a tethered Jailbreak and will need to boot it using RedSn0w. Step 8) – Launch RedSn0w again if you exited out of it, click the Extras button, click the Select IPSW button, browse for your device’s iOS 6 firmware again and then click the Just Boot button. You will now need to put the iPhone or iPod Touch into DFU mode again. Once your iOS device is in DFU mode it will boot into a Jailbroken state. Note: Remember that you will need to repeat Step 8 every time your iPhone or iPod Touch loses power. 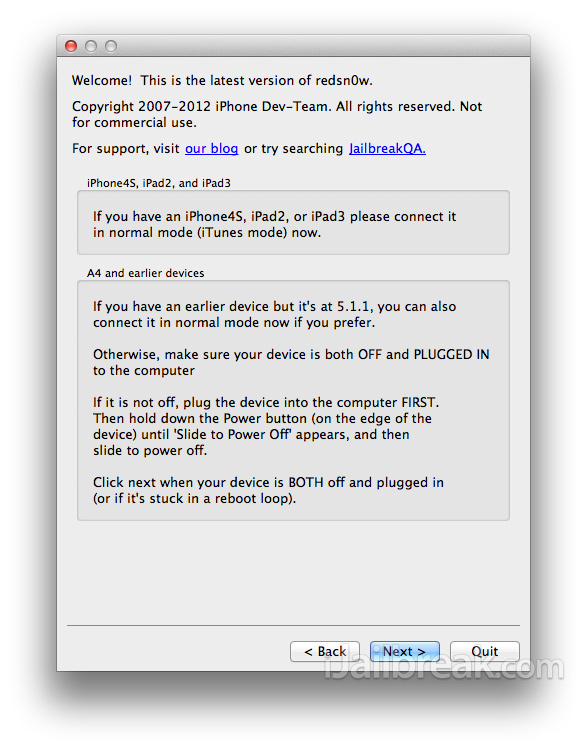 Your iPhone 4, iPhone 3GS or iPod Touch 4G should now be Jailbroken on the iOS 6.0.1 firmware tethered. Congratulations! All that you need to do now is fire up Cydia and begin installing your favourite tweaks. If you have any further questions or thoughts please turn your attention to the comments section below. i keep getting missing keys.plist and cant find any help online how can i fix? Use the ios 6.0 ipsw instead of 6.0.1 when you hit “select ipsw” That should fix it. I am stuck in “please wait ” …..what to do ? I did everything exactly you said. My iphone 4 is v ios 6.0.1 . please help.!!! Tethered iPhone can be unlocked? I have a SPRINT IOS 6 iPhone 4 3.0.04 and I want unlock him. 3gs bb 05.16.07 this bb unlock? i dont have mac. can i download it on windows or whats the other option? maybe you had installed something in cydia? you had to uninstall it ex. sbsettings..
My iphone 4 is v ios 6.0.1 .
jailbreak process was successful, as well as the “just boot” process, but Cydia is still not installed. I’ve done the whole process 5x already, and i’m using 6.0 firmware to jailbreak. my iphone 3gs not powering how can i?